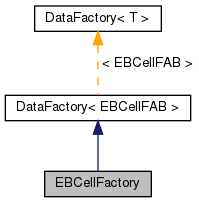 Factory class to produce EBCellFABs. Factory class to produce EBCellFABs. This is needed for LevelData construction. Creates a new baseebcellfab object and returns a pointer to it. Responsiblitly for calling operator 'delete' on this pointer is passed to the user.